Over the past few years I was called to my friend Annette’s deathbed a couple of different times. The hospital is just a short drive from my house, so I kept her company during many emergency room visits. If she got admitted for an extended stay, I’d merrily come and go twice daily, delighted to have her in my neighborhood. When we spoke about dying, she joked. 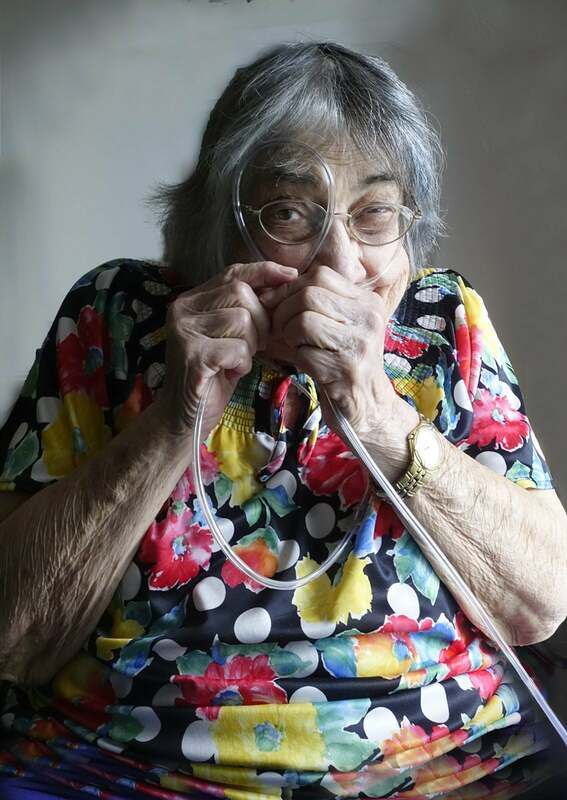 She twisted her oxygen tube into a noose around her neck. Then she shaped it into an angel’s halo and held it over her head. She got me laughing ‘til I was short of breath myself. My friend for over thirty years. She made me feel adventurous and indestructible, like we could go on forever outwitting the angel of death. And we did. For a while, she always bounced back. As per her request, I’d fetch steamed lobsters and double-chocolate-chip muffins from Wegmans, to celebrate the victory. Annette died. And, since I wasn’t with her, since I didn’t get to see her ever-lively self in a lifeless state, I’m left trying to convince myself she’s no longer just across town or only a phone call away. She’s gone, I have to keep reminding myself. No more wild road trips wondering if the oxygen tank would last. No more silly antics during the most solemn moments. No more photo-shoots where she’d literally bend over backwards to give me a great shot. I’m just beginning to realize all the ways I will miss her. When you lose a child it’s like losing a limb or a vital organ. But when you lose a good friend, you lose some deep-rooted, invisible, remarkable, un-nameable thing that allowed your spirit to soar. Who was the friend whose death broke your heart? How do you honor the memory of a good friend? This entry was posted in 2018 and tagged death and grief, grieving death of a friend, Healing From Loss, in memory of a friend, losing a friend to death, missing my friend, remembering a friend on 2018/10/07 by Robin Botie. Thank you for this beautiful, tender, love-filled tribute to Annette and friendship. I could see in your photos and blogs over the last years how much she loved and trusted you. Thank you for standing by her in her hardest times. I know so many cases where a person slips to the other side without the people they counted on with them or even knowing it was “the moment.” My mother-in-law’s death is a recent example. I’m sorry for the grief you must feel about losing such a wonderful friend. Oh, Elaine. What you did for your mother-in-law. I hope that someday I’ll get to have a wonderful daughter-in-law who cares about me, or at least takes care to see that I’m doing okay. I understand that people sometimes wait until their family and friends have left, in order to die. It is not something you can count on being able to witness or share. I feel a bit bad that Annette died without me being there in the hospital with her that one last time. But I’m grateful I was there for all those false alarms and hours of being well enough to complain about being sick and hospitalized. They were indeed hard times. But Annette sure could make me laugh even then. My deepest sympathy on the loss of your friend. Your photo of her is wonderful, so playful, in keeping with the vibrant colors on her shirt. I will take a cue from Annette when it’s my time to go: keep on playing. Laughter, even over black humor, must cheat death of its sting. It was so great for Annette that she had playful friends who could laugh with her. Well, Lucy. I wish I could call myself playful. Annette kinda made everyone around her smile, if not pee-in-their-pants break-down-in-laughter. I was mostly just along for the ride but yow, what a ride. “Keep on playing.” Yes, hopefully this is one of the lessons I will take with me now. Thank you, Lucy. Wise words, Robin. So sorry for the loss of your friend. I’m sorry to hear of Annette’s death. I know she was a special friend and that you will miss her. I know the feeling from the time my dear friend Pearl Bromberg passed away . She had been a very important long time neighbor and close friend. I still think of her often. Yeah. I think of Pearl too. I must show you her photos that Debbi posts on Facebook every month for this year, since Pearl died. Annette loved having her photos on Facebook and my blog. I wonder if I’ll ever find another friend who enjoys being in front of a camera as much as she did. Thank you, Lynne. I guess we’ll be seeing more and more loss of old friends now. Seems to be that time, when the last of the aunts and uncles and parents have gone. Then it’s time for the friends.